The Birds Faststamps continue to produce surprises long after the farm animals have arrived. Following on from the Cambridge 40g Birds 1 reported earlier in the year, We've now been told about another batch originating from the Truro Post and Go machines. These were sold on eBay for a Buy-it-Now price of £350. We don't know how many were produced from the Truro office, nor when (but see update, below). Now, can there be any other offices which still have Birds to surprise us with? With the change-over from Wincor-Nixdorf machines to NCR Self-Service Kiosks a lot of old stocks came out from branch storage and many more surprises followed. Birds 1 was identified from a couple of offices in April 2014 with more the latest (60g) new tariff indicators. I wasn't aware of this until the following January. UPDATE 7 June: Machine 1 at Truro is now dispensing Flags Faststamps, and as the image below shows, the transaction number is some 5500 more than shown on the Birds 1. It is impossible to know what the regular usage is a Truro, without which the production date of the Birds 1 40g cannot be determined for sure, but it suggests that they were obtained some time ago, probably around the end of 2011. A further set of Birds 1 40g, probably also from Truro, is now for sale on eBay with a Buy-it-Now of £225 but the seller has covered up the identity line with his logo for some reason best known to himself. Sadly the seller offering (Truro?) sets at £225 is unable to supply the matching receipts. Also worth noting the recent appearance of Birds 1 WW40g values issued at Harrogate (which was also a source of Birds II 40g stamps). Does anyone know if Royal Mail produced a FDC for this issue. I didnt keep a record of what I had ordered, and received the Presentation pack OK, but feel sure I ordered a FDC as well, which as yet has not arrived. If you are referring to the Birds (main topic) the answer is yes. 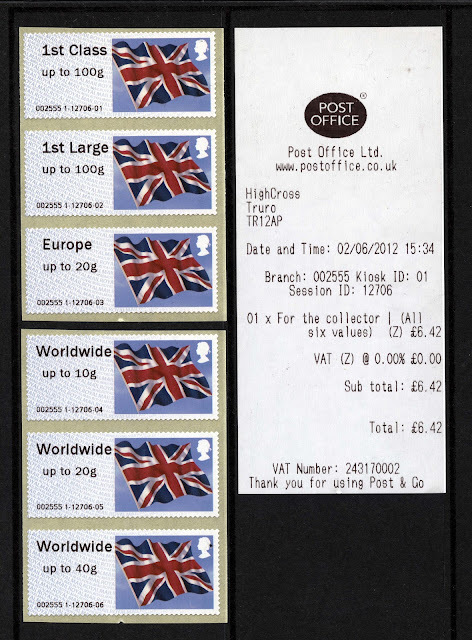 If you are referring to the Flags, I'm surprised you received a pack: Royal Mail advised customers that the pack and FDC would not be part of the standing order. If you didn't get that notification you might still be able to get a FDC if you phone them. Ian, I am referring to the Flags, it was not part of a standing order, I placed an order on the Royal Mail website for 4 Packs with a single stamp in, and a FDC. The packs i recieved a few weeks back, but the FDC did not follow. I called Royal Mail this morning, they did not know why the FDC had not been sent out either but promised to put one in the post. Good - glad they sorted that out for you.